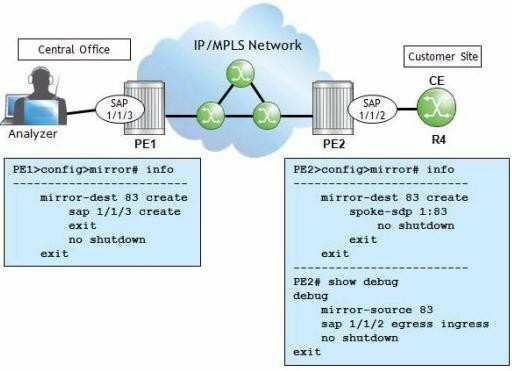 What must be configured before a SAP can be created on an E-pipe? The Ethernet port must be set to network mode, and the service must have a spoke SDP. The Ethernet port must be set to access mode, and the service must have a spoke SDP. The Ethernet port must be set to network mode. The Ethernet port must be set to access mode. The frame is forwarded with no provider VLAN tag. The service ID is added as the provider VLAN tag. A VLAN tag of 0 is added as the provider VLAN tag. Spoke SDPs prevent loops in a VPLS. A mesh SDP is identical to a spoke SDP except for its flooding behavior. Mesh SDPs and spoke SDPs can be used in the same VPLS. A spoke SDP does not require the routers at both ends to be directly connected. By default, what does an Alcatel-Lucent 7750 SR do to support VPLS services for different customers? Dedicates a separate port for each customer. Maintains a different MAC Forwarding Database for each service. Performs ARP look-ups for each service. Maintains a different IP routing table for each service. PEs, how many mesh SDPs need to be configured for this service? Which of the following about an E-pipe terminating on a VPLS is FALSE? The VC-IDs used between the E-pipe and VPLS must match. The service MTU of the VPLS and E-pipe must match. The E-pipe must maintain a MAC FDB in order to connect to the VPLS. The service ID of the E-pipe can be different from that of the VPLS. Which of the following best describes how a MAC FDB is populated in a VPLS service? The router is programmed with MAC addresses by the network administrator. The router uses reverse ARP (RARP) to resolve the MAC addresses for unknown destinations. The router reads the destination MAC address of frames passing through the service. The router reads the source MAC address of frames passing through the service. The mesh SDP on router R4 has been shutdown. The IngLbl and EgrLbl that router R4 has for 10.10.10.1 are identical. The mesh SDP on 10.10.10.1 has been shutdown. The service MTU on 10.10.10.1 has been set to a different value. 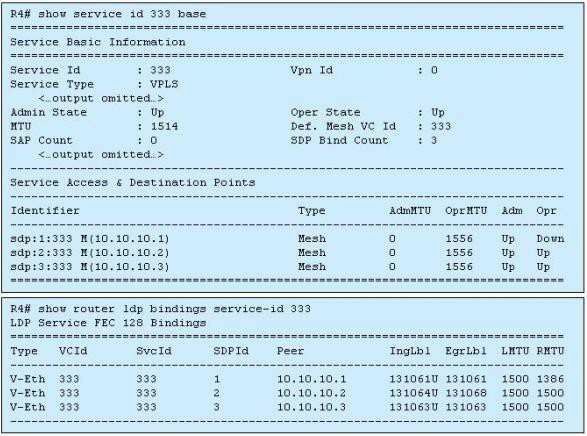 How many service labels must be signaled to bring up a fully-meshed VPLS among five PE routers? PE1 and PE2 need a mirror source specified. PE1 needs a mirror destination with the remote source specified. Click the exhibit.Which OAM tool produced this output? Which OAM tool produced this output? between PE2 and the customer site? A mirror source needs to be added to PE1 with a "remote-source". OAM command output, which of the following is FALSE? The E-pipe can support a maximum MTU size of 1578. If the step size was 2, the maximum response size would be the same. The ports of the link PE2-PE3 have an MTU of 1578. An svc-ping of the E-pipe will succeed. Which one of the following items CANNOT be used as a mirror source on an Alcatel-Lucent 7750 SR? 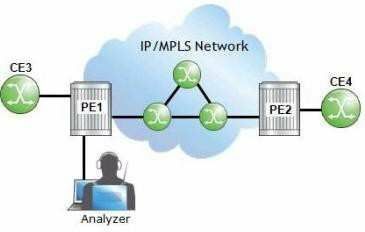 Which of the following about the Alcatel-Lucent 7750 SR's sdp-ping utility is FALSE? It tests uni-directional or round-trip in-band connectivity. 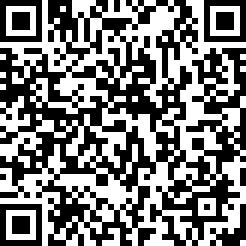 It can be used by specifying only an SDP ID. It tests the reachability of hosts that are using an SDP. It tests the reachability of the far-end IP address of an SDP through its tunnel. 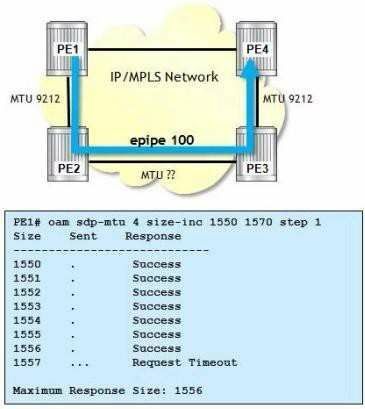 encapsulated SDP with a service MTU of 1500? 'remote-sdp'. Which of the following is TRUE? iocal-sdp' and 'remote-sdp' indicate that all services using these SDPs are pinged. 'Iocal-sdp' indicates that the ping is sent in-band, and remote-sdp' indicates the return ping is in-band. 'Iocal-sdp' and remote-sdp' indicate that pings are initiated from both local and remote routers. Both 'Iocal-sdp' and 'remote-sdp' take parameters to specify which SDPs are used for the test.